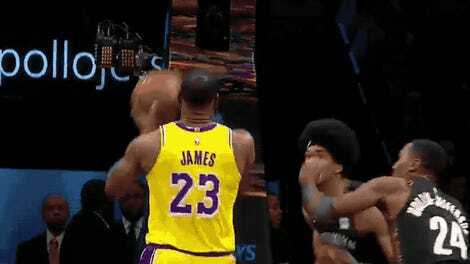 It’s easy to see why you—basketball reporter or blogger or TV analyst or general enthusiast not hailing from New Orleans—might salivate at the prospect at Anthony Davis and LeBron James on the same roster. I’m right there with you. It’s an enticing prospect, because it would provide a flesh-and-blood answer to a lingering thought experiment—what if, after all those big stiffs and stretch-fives, James finally had a bouncy, freaky, world-beating big man for a teammate? He’s had a lot of co-stars, but none in that mold. That doesn’t mean this pairing can just be willed into existence. For one, the Lakers aren’t necessarily the hottest suitor. The Celtics can construct the most compelling bundle of picks and young talent come the offseason. Even so, the Pelicans have no incentive to let go of generational talent, and will do everything conceivable to stop that from happening, including but not limited to prostrating themselves before Davis as they hand him the fattest supermax contract in NBA history this offseason. As for the Brow, he’s never made any public remarks to suggest that he wants out of New Orleans. 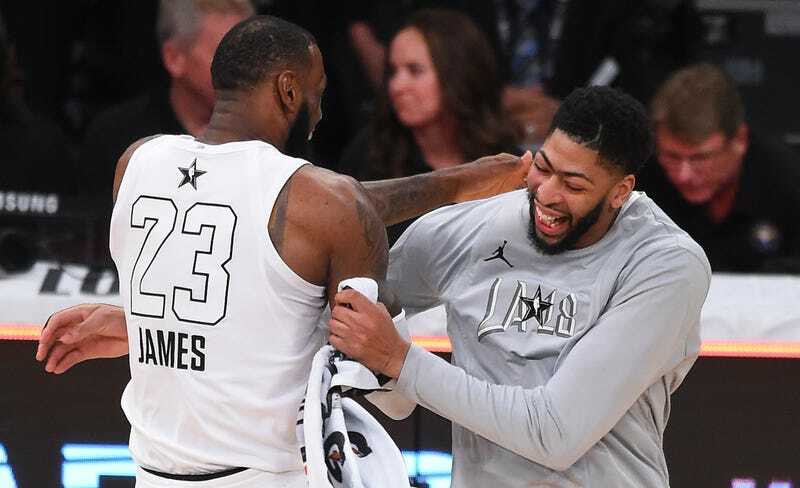 Ahead of Anthony Davis and the New Orleans Pelicans visiting the Los Angeles Lakers for the first time this season on Friday, LeBron James openly pondered what having the All-Star forward alongside him in purple and gold at Staples Center would be like. Is that out-of-the-blue, “openly pondering”—just James bringing up AD unprompted? That would be juicy. The article makes the somewhat startling claim that James wanted to talk about this because he had watched ESPN that day. “James had Davis on his mind after seeing ESPN’s Adrian Wojnarowski laying out the Lakers’ trade priorities in a segment that aired on Tuesday’s SportsCenter,” McMenamin writes. If LeBron James is getting trade ideas in his head from SportsCenter, that’s fascinating, and it would be gold to print a quote to that effect. So why isn’t it there? In its absence, that framing is self-aggrandizing enough to raise an eyebrow. But let’s return to the words James actually said. “That would be amazing ... That would be amazing, like duh. That would be incredible.” Based on the syntax of James’s quote, he’s responding to something. This is one of many instances where it’d be clarifying to present or at least paraphrase the question being asked by the reporter. LeBron’s quote would take on very different flavors depending on whether it’s answering “Would it be fun to play basketball with the incredible basketball man Anthony Davis?” or “Would you ship away Brandon Ingram, Josh Hart, Kyle Kuzma, first-rounders, Bronny, and the whole Ball clan to get your hands on Anthony Davis?” The first case is so banal as to deserve that “duh,” but the second case is a little more interesting, since it means James—who said he’d be patient with the Lakers—is toggling into his all-too-familiar “agitate for trade” mode. ESPN’s Brian Windhorst was so aroused by that second possibility that he tacked on his own article to his colleague’s reporting, though by some confusing trick of timestamps or in-house hierarchy, it was somehow published on ESPN before McMenamin’s, despite McMenamin’s having procured the quote. So Windhorst took a juicy little report by someone else, wrote his own snappy blog post reading heavily into that report, and then published under his own byline. Does that count as aggregation, Brian? This was a smaller example of the Worldwide Leader’s tested flood-the-zone strategy. Woj offers analysis on TV, so that gets cycled into First Take and re-aired and inspires LeBron to give a quote to McMenamin, then that serves as fuel for a near-simultaneous Windhorst column. Perhaps tomorrow Stephen A. Smith will be lauding the talent of LeBron’s current teammates, Boobie Gibson and Zydrunas Ilgauskas. None of this tells you very much about Anthony Davis going to the Lakers.